This is a conceptual image of spin current flow in a superconductor. 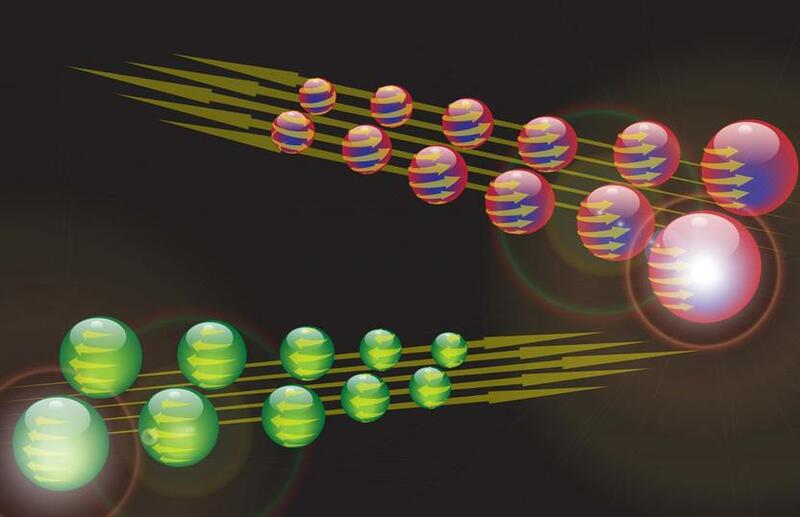 Now, the same researchers have found a set of materials which encourage the pairing of spin-aligned electrons, so that a spin current flows more effectively in the superconducting state than in the non-superconducting (normal) state. "Although some aspects of normal state spin electronics, or spintronics, are more efficient than standard semiconductor electronics, the large-scale application has been prevented because the large charge currents required to generate spin currents waste too much energy," said Professor Mark Blamire of Cambridge's Department of Materials Science and Metallurgy, who led the research. "A fully-superconducting method of generating and controlling spin currents offers a way to improve on this." In the current work, Blamire and his collaborators used a multi-layered stack of metal films in which each layer was only a few nanometres thick. They observed that when a microwave field was applied to the films, it caused the central magnetic layer to emit a spin current into the superconductor next to it. "If we used only a superconductor, the spin current is blocked once the system is cooled below the temperature when it becomes a superconductor," said Blamire. "The surprising result was that when we added a platinum layer to the superconductor, the spin current in the superconducting state was greater than in the normal state." Although the researchers have shown that certain superconductors can carry spin currents, so far these only occur over short distances. The next step for the research team is to understand how to increase the distance and how to control the spin currents.